Colleague Tim James is very optimistic about the role that Portuguese varieties can play when it comes to local table wines (see here) while I’m more inclined to adopt a more wait-and-see approach. 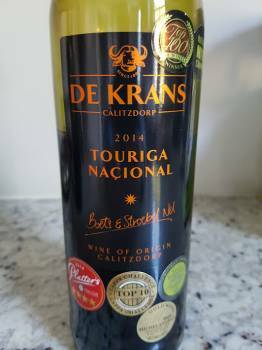 The Tritonia 2014 from Calitzdorp producer De Krans, consisting of Touriga Naçional, Tinta Roriz, Tinta Barocca and Tinta Amerla and selling for R140 a bottle, rated 87 on the 100-point in the recent Laurium Capital Signature Red Blend Report and I also recently got to sample the 2014 vintages of Tinta Roriz and Touriga Naçionalfrom the same producer. Tinta Roriz is the common Portuguese name for Tempranillo, the grape associated with Rioja in Spain. Red fruit, spice and herbs and on the nose. The palate is medium bodied with fresh acidity and fine tannins. Understated but arguably a bit short of detail. Red and black fruit, some floral fragrance as well as a hint of reduction. Good fruit expression, bright acidity and fine tannins. More full bodied than the Tinta Roriz.